Hot on the heels of a fairly good recommendation by my friend, yet another recommendation from another friend cropped up almost from nowhere. Actually, it’s not much of a surprise: we’ve constantly been updating each other on the movies that we have caught at the festival (“Dude, you’ve GOT to go see ‘Sell Out!'”). Generally speaking, though, it is often based on the fact that we have indeed seen the film, rather than thinking that the poster actually looks nice. Having said that, the poster for Kanchivaram wasn’t all that bad either. It wouldn’t, however, have been enough to drag me in. I like my sleep. I have learned that the secret to enjoying a film festival properly is to really make sure that as much as we watch the movies, party, and dance the night away while telling people that you don’t drink alcohol (the pressure inevitably grows after your friends have had a few). And so sleep, when properly channeled, becomes as essential an ingredient to the mix of enjoying oneself. After all, no one likes to fall asleep inside the cinema, no matter how hard you try. He wouldn't share his chewing gum for all the tea in China. So, I like my sleep. But I like good movies even better. And my friend’s strong and persuasive recommendation for a film that he hasn’t even seen yet kinda pushed me further down the path. The ticket wouldn’t cost me a thing, since I had my pass, and I might even enjoy it. I rarely watch films from India, for some reason, and diversity is the spice of life, isn’t it not? Well, it very well should be, even if it isn’t. For someone who wants to be a filmmaker, however, diversity is as much a necessity as it is a choice. You can never say shut yourself off from potential sources of inspiration, and you can never so no to a good film. Diversity, then, in terms of the films you watch, will give you a better idea of what you want to shoot. Sometimes, just as importantly, it also gives you an idea of what you don’t want to do. "OK, I'll make your sari, but I want some muruku in return." ‘Kanchivaram’, then, falls firmly in the camp of the former. Set just after India’s independence from those dastardly British, the film starts with Vengadam (Prakash Raj) being transferred from a prison back to his hometown, Kanchivaram. You’d think that a man under such heavy security (constantly being cuffed) would be a murderer or something of the sort. Rather, the truth is rather more simple: he is a silk weaver. As the journey progresses, his past is revealed via a number of catalysts, such as the sounds of the stormy night. We learn, then, of the ambition that this humble man dreams off. 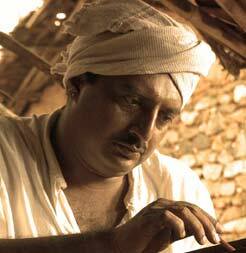 Despite his undoubted skill, working for a rich man and weaving him plenty of silk saris, he doesn’t make much money. Even more importantly, he doesn’t have the much of a chance to fulfill his ambition since he was young: to give his bride a silk sari. Now, it’s not like these days, when it seems as if a silk sari is abundant available for everyone. Within the context described, a mere silk weaver even coming close to owning a sari is like a rubber tapper blinging it in a nice Ferrari. Not very likely, and in ‘Kanchivaram’, damn near impossible. "The root of 89.3 multiplied by 3 is..."
He works to try to fulfil this, but life being as life is, at various points of he, he has to give it up to ensure that others are not to be left behind. For example, after his brother in law lost a lot of money on bad businesses, he confided to Vengadam that he is not able to take care of Vengadam’s sister. He gave him all of the money that he had saved for the sari, just so that his sister is able to live a normal life. He wasn’t able to fulfill this particular dream, then, but then he shifted his attention to ensuring that his daughter will be able to wear a sari for her wedding day. Through such events do we see of the kind and compassionate man that he is, and the seed of communism. Wait, what? Communism? Yes, you read that right. This film, in a way, has a very Communist agenda at its heart. The low pay, long hours, and little chance of an improvement sees Vengadam striving to improve the workers’ conditions. There’s also the small matter of making sure that he has enough silk to make the sari for his daughter, so while he saves up the money for that one, driven by his desire to fulfill his promise to his family, he resorts to underhanded tactics to realise that dream. Red = prosperous in any culture. That, at the heart of it all, is the crux of the film. The director’s tendency to pull things together from the past and the present is very interesting, almost Christopher Nolan-esque in a way (although he doesn’t really come close; nobody messes up a movie’s timeline more than Mr Nolan). He is helped in no small part by a very strong performance by Prakash Raj. I’m told by my friend that it’s not quite the usual territory for him to be venturing into, which is all the more reason to credit him with a very solid performance. It is through him that we live the trials and tribulations of the oppressed. In moments of solitude, his body language is more often than not more than enough to convey a sense of defeat. Of course, it’s not much of an Indian film without having a closer look at an aspect of Indian culture or history. The director, Priyadarshan, made sure that the audience would know exactly what the deal is. The film even has prologues and epilogues describing the context that the film is set in. Every little thing, then, is constructed to clearly propagate this particular agenda. For example, Vengadam is the fine humanist that everyone can root for (witness the stand he takes for a suspected thief earlier in the film), while his boss, for the most part, appears to be a rather heartless man. Perhaps a further exposition into making the characters a little more vague would be most welcome, but then again, we shall not forget that this film is as much a propaganda tool for communism/socialism/any sort of such-ism as it is a feature film. In that context then, he did a good job of achieving his objective of obtaining my pity and sympathy not only for Vengadam (oh, what a heartbreaking final scene it was…), but also for the people that he is supposed to represent. After all, the film’s poster has the hammer and the sickle of Soviet Union on it. In that regard, then, it does exactly what it says on the tin. At least you won’t fall asleep watching it. Fikri likes to call himself a Commie, but it’s more of a reference to his Communication background. Saangatya here. Saangatya is a new group blogging on movies. Actually this is a forum for discuss good movies in a “blog flatform’. Saangatya liked ur blog. saangatya simultaniously blogging in kannada and English (www.saangatya.blogspot.com is aenglish blog). Sure, no worries. Thanks for dropping by.